Line 6 (violet L6) Barcelona Metro. Updated 2019. 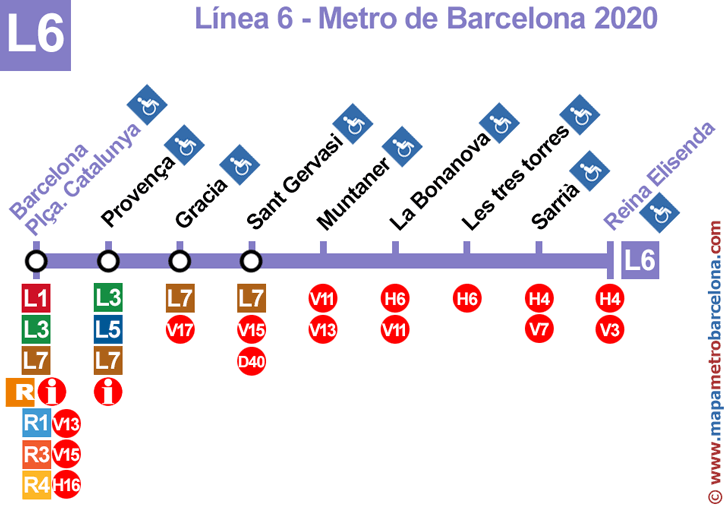 On this website we have the best map of line 6 of the Barcelona Metro (violet line), the most complete and updated Internet. We have MapaMetroBarcelona.com designed to make life easier for travelers to our city subway. Our map looks like a typical map that can be found at any metro station, but we've redesigned from scratch with some unreleased stuff so far, such as transfers to the new bus rapid transit, the duration between the major subway stations, and we have also marked the Metro stops are adapted to people who are in wheelchairs, prams or luggage. This is the list of all metro stations of line 6 (violet line). Next to the name of the stop, we've added if you can make a transfer to other transport. Barcelona - Plaça Catalunya (transshipment: metro L1, metro L3, metro L7, Tren Regional R1, Tren Regional R3, Tren Regional R4). Provença (transshipment: metro L3, metro L5, metro L7). Sant Gervasi (transshipment: metro L7). Thank you very much for your visit, we hope that our Barcelona Metro Map line 6 has been useful to you.